Do more with a battery that can go for up to four days before needing a charge. And when it does require a charge, simply set it down on its wireless charging dock for a quick working charge. Head for adventure in the great outdoors without your phone thanks to built in GPS on the Gear S3, and the SOS service allows you to stay safe with three presses on the home button to send an alert to the security company you're signed up with. Take and make calls with the built-in speaker on the Gear S3, and check voice messages and hear the alarms you set. 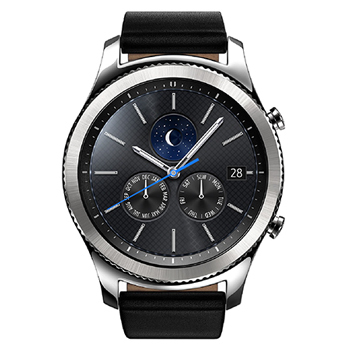 Use Samsung Pay on the go as the Gear S3 supports both MST (Magnetic Secure Transmission) and NFC (Near Field Communication) payment technologies. Put on your Bluetooth headset and listen to your songs or stream your playlist. 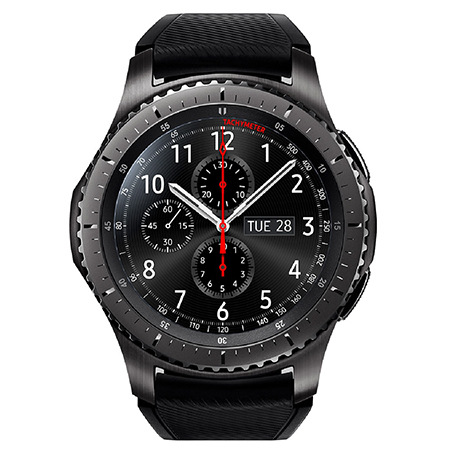 The Samsung Gear S3 is designed to look like a real watch, but offer more with a bezel, crown and crystal that can be turned, pressed or tapped for convenience, fun and pure freedom from your phone. Transform the appearance of your Gear S3 just by changing the watch face or swap wrist bands (sold separately) for different occasions. The IP68 rating ensures the smartwatch is able to withstand dust and dirt and being up to 1.5 meters or for up to 30 minutes underwater. Access over 10,000 apps from your waerable, allowing you to track your progress on the elliptical, row machine and much more. Sync the Gear S3 with the S Health app to get detailed information and long-term reports on your workouts and on the progress you're making.